When Oakland Mayor Libby Schaaf announced impending ICE raids in Northern California last month, she landed in the national spotlight over the question of whether she abetted criminals by tipping them off to law enforcement plans. But here in Oakland, the controversy over her decision centered around one issue: panic. Did the announcement cause more of it among the city’s immigrants? How can it be avoided? When Mayor Schaaf spoke to the press, she addressed the concern directly: “No quiero crear pánico” (”I don’t want to cause panic”) she said, explaining that sowing fear in immigrant communities is one of ICE’s tactics. “Es importante que todos se preparan” (“it is important that everyone prepare themselves”). For politicians and activists, as well as journalists and newsrooms, the response on the ground raises one central question: How can news and information empower rather than cause panic? For many immigrants, the feelings of fear, confusion, and misinformation are constant. In Oakland, one in five residents speaks Spanish at home, and a growing number speak indigenous Mayan languages. As a group, Latinos earn the lowest wages in the costly Bay Area, and for many Latino immigrants, reports of ICE raids are only one source of panic among a barrage of possibilities: an eviction notice for a family just making ends meet; a workplace injury for someone who lacks legal status; a teenager pressured to join a gang. How do residents find information to help them navigate these personal crises? How do they share their stories so that government officials, direct service providers, and the wider community can take action? Interviews with more than a dozen community leaders indicates that quite often, they don’t. For 6 years, I used video evidence to document human rights abuses around the world, so that advocates and policy makers could have the information they need to take action. Turning my attention closer to home, I wanted to understand why my own immigrant neighbors and relatives often lack the information they need to make decisions. So last year, with the support of the Listening Post Collective, a project of Internews, I set out to learn how Oakland’s Latino immigrants access news and information, and how journalists can better serve them. For nine months, I met with church leaders and librarians, grassroots organizers, leaders of health clinics, women’s empowerment groups, and legal advocacy agencies. I attended “know your rights” trainings, neighborhood forums, and citywide town halls, and talked with many of the residents I met there. What I found were residents hungry for news and resources that will help them be safe, healthy, and engaged in their community, and who are frustrated by just how difficult it is to find that information. In basement meetings and on phone calls, grassroots organizers and faith leaders work long hours to connect residents to relevant information. With limited resources, they are faced with communicating the constant and often dire policy changes coming from the Trump administration. The observations I heard from Latino immigrants by and large echo those captured in recent studies of news consumers. Yet rarely do those studies focus on immigrant communities, and rarely are solutions developed by the journalism industry designed for non-English-speaking audiences. By collaborating with the Listening Post Collective, along with leaders, organizations, and residents, to map the information needs of Oakland’s Latino immigrants, we hope to contribute to a better understanding of how news outlets and others can provide information that engages and empowers this community. This is the first in a series documenting our efforts to map the information needs of Oakland’s Latino immigrants. Next up: How we collaborated with community organizations to research what sort of news and information residents want, and what we learned in the process. 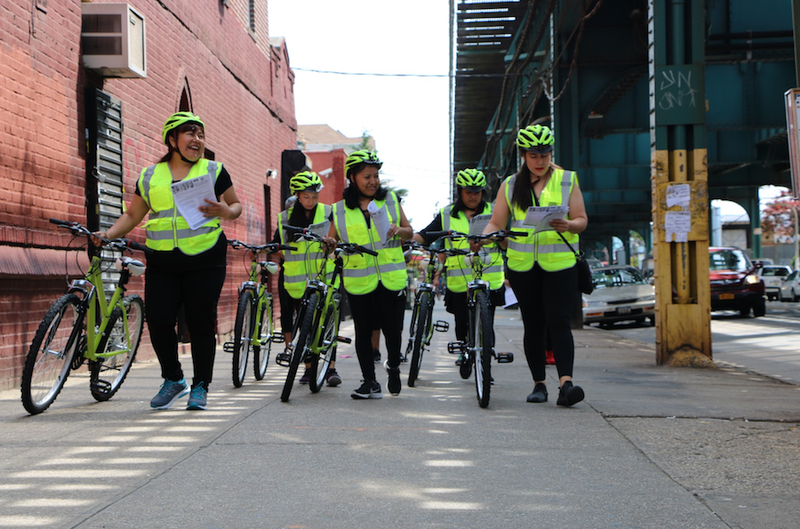 Each weekend this summer, a group of women donning neon vests and helmets has mounted bicycles and dispersed throughout Corona, Queens, to hand-deliver information to the neighborhood’s Latino immigrants. The women are members of the grassroots organization, Mujeres en Movimiento(“women in movement”), which partnered with the Mayor’s Office of Immigrant Affairs (MOIA) and the Department of Cultural Affairs to launch CycleNews. The pilot kicked off in late May, and two months later in a backyard in Corona, I had a chance to sit down with some of the women behind it to learn what motivated CycleNews, and why choose bikes, clipboards, and info cards to reach Latino immigrants with news and information. The idea, they explained, builds on Immigrant Movement International, an art project and community center developed by artist Tania Bruguera in 2011 in collaboration with the Queens Museum and Creative Time. The artist encouraged community members to imagine a better Queens, and empowered them to manifest that vision, drawing from tactics of art and community organizing. As the current Public Artist in Residence with MOIA, she has continued to collaborate with immigrants to pursue those questions and design ways to create their own solutions. One of the gaps identified through this process was free group exercise, hence the creation of Mujeres en Movimiento, which began as a dance therapy group and has grown into a grassroots organization that advocates for bike safety and the empowerment of immigrant women. In a city with one of the country’s most vibrant ethnic media ecosystems, what’s wrong with the news provided by local Spanish-language newspapers, television, and radio? Plenty. “Many people say that the news outlets misinform. That what they do is frighten the community,” said Valeria Reyes, echoing a complaint I’ve heard from immigrants in Oakland about their local Spanish-language media. “They are motivated by ratings,” Valeria added, so they prioritize shock value over providing useful information. That’s what they are trying to do through CycleNews. When the women disperse on bikes throughout the community on Saturday afternoons and Sunday mornings, they take two things with them. One is a stack of cards with information about municipal services available to immigrants and how to access them. There is an illustration on one side, and Spanish text on the other. They use these cards to talk to people on the street and engage them in conversation about what city services they might need. Now that the pilot has come to an end, Mujeres en Movimiento and their partners will evaluate the success of CycleNews and determine if and how to continue to spread information to the city’s immigrants on two wheels and from one person to another. This is the second in an occasional series exploring offline approaches to distributing news. How does your community share news and information in person? How would you like to see a version of CycleNews implemented where you live? How might news delivered on bike engage audiences that wouldn’t be reached on a website, Twitter, or mobile notification? For the first blog in the series, about plans to reach rural communities in Zimbabwe from the founder of 263Chat, click here. From the Petronio Alvarez festival in Cali, Colombia, south to Ecuador, Peru, and Bolivia, music I picked up during 18 weeks traveling the Andes. Much gratitude to the music vendors along the journey who took the time to school me and JL on their favorites from the region and send us off with a shortstack of the best in their collection. If news innovation is understood through the lens of digital technology, who is left behind? What opportunities are missed, what audiences are neglected, and whose voices and stories are left out? That question has plagued Nigel Mugamu. Nigel is the founder of 263Chat, a media outlet that uses Twitter conversations, WhatsApp groups, and videos to engage Zimbabweans in conversations about national affairs. The outlet, founded in 2012, has more than 200 thousand Twitter followers, and Nigel has won several awards for entrepreneurship and innovation. But while the news company has grown, Nigel is conscious of the fact that a large fraction of the country will never check out his website or take part in Twitter chats. That’s because a majority of Zimbabweans live in the countryside, and most of them have limited to no internet access. This resonated with me. While the digital divide is not nearly as stark in the U.S. as it is in Zimbabwe, internet use is very different across socio-economic, generational, and ethnic divides. I know plenty of people in their 60s and 70s who have internet access but prefer to read their paper in print because it’s been a part of their routine for decades. Some working-class news consumers have limited cellphone data and are less likely to stream videos or download news apps on their phones. And in rural and immigrant communities, many people rely primarily on offline social networks for news and information. What sorts of innovative distribution strategies will more effectively reach those audiences? 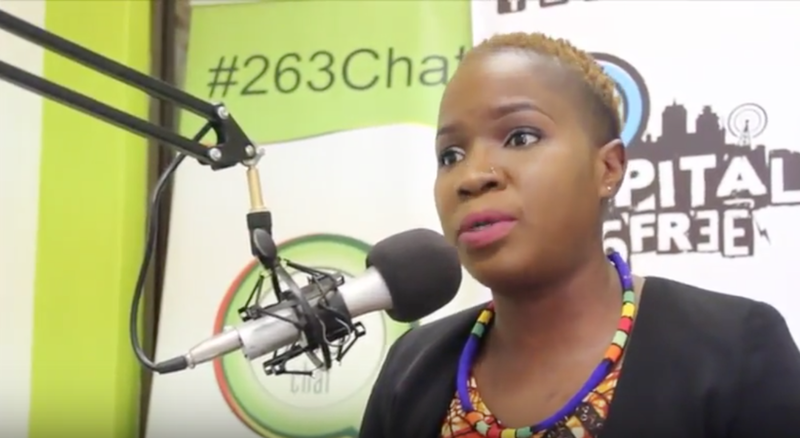 For many Zimbabweans, especially the 60 percent of the population that lives in the countryside, the Twitter chats and online articles produced by 263Chat, not to mention their YouTube videos, will never reach them. “A lot of times,” he said, “marginalized communities are missing out on conversations that influence and affect them.” He realized he needed to go to where those communities are. Another technology popular in Zimbabwe is DVDs. Street vendors hawk copies of the latest movies and television shows, which buyers can watch, trade with friends, and recirculate. 263Chat produces plenty of videos for their website and social media, but now the team is thinking, “why don’t we put these on a DVD and hand them out in the city?” For now, it’s just an idea, but Nigel has a vision of DVDs containing a series of short videos on news, culture, and public affairs, sponsored by advertisements, distributed on the streets, and delivered on motorbikes to rural villages. Finally, Nigel is thinking through how mobile content can circulate through a community that lacks internet access. By sharing information on WhatsApp via an image or an entire article, rather than a link to an online report, that information can then be spread via SMS or simply shared in person. “For people who don’t have access, someone in the community has a smartphone, and sometime during the week, that person congregates and shares it with others.” Think of it as the 21st century version of leaving a newspaper on the bus. In the next few weeks I’ll be sharing other examples of low-tech innovation designed to reach marginalized communities, and I’d love to hear from you. How has digital-first innovation left offline audiences behind? What other ways do news publishers and consumers “take the internet off the internet” and distribute it to offline communities? Chime in with a comment to share your thoughts. For the past four years, my life in New York City consisted of a regular trip from my home in Crown Heights, Brooklyn, to spend an evening with my in-laws in Ridgewood, Queens. There, my husband’s mom introduced me to Andean dishes like llapingachos — a pillowy, cheese-filled, potato pancake — and taught me how to create perfect folds in the preparation of empanadas. The food, of course, wasn’t the only cultural difference between my husband’s family and my own. When it came to news, I was effectively traveling from the most media-saturated landscape in the country — one designed for a college-educated, iPhone-equipped, white professional like myself — to a very different ecosystem for Spanish-speaking immigrants. My husband’s parents, Ecuadorean immigrants who construct condominiums and clean homes, do not receive email newsletters or mobile news alerts. They have never been invited to a town hall to mingle with newsmakers and offer up story ideas. Google Cardboard has not arrived in the mail. Their media diet consists of Univision news and El Diario La Prensa — the country’s oldest Spanish-language daily. But those outlets are often insufficient when it comes to local news that addresses their immediate concerns. Univision’s strength is its national reporting, and El Diario La Prensa has thinned out in recent years after several rounds of staff cuts. And so they get their news just as often from church acquaintances, friends, and lawyers. Their options for news and information may be limited, unreliable, and, at times, expensive, but they are better off than many immigrants elsewhere in the country, who have no local news catered to their concerns and delivered in their language. And in communities with few or no local media outlets, fake news and misinformation spread quickly. In February, a relative sent us an article about Trump’s plans to ease visa restrictions for Ecuadorean visitors. “Is this true?” she wrote on WhatsApp. The same fake news story had spread throughout diaspora communities from around the world. At the same time, unchecked and often false rumors of ICE raids among immigrant communities have fueled fear and mistrust. While the news deserts in middle America have been well documented, trends in ethnic media have been less so. But a few figures paint a picture of the yawning gap between the news industry and the country’s immigrant communities: In the past 45 years, the number of foreign-born Americans has climbed, their share of the population nearing the historic levels of 125 years ago, during the height of European immigration. Back then, more than1,000 German language newspapers were published to serve what was at the time the country’s largest non-English-speaking immigrant community. Today, there are a total of four dailies serving Spanish-speaking immigrants, down from 35 in 2002. Since Trump’s election, many journalists, news executives, and media funders have undertaken a long overdue reflection into the disconnect between the media and much of America — a gap that is often framed as separating the cosmopolitan coasts from the rural and suburban heartland.But we need not hop on a plane to find communities that have been neglected and unnewsed. Media bubbles are not only geographic, they are also linguistic, cultural, and economic. And like middle America, immigrant communities are increasingly neglected by local newsrooms and left behind by the industry’s investment in new business models, distribution strategies, and reporting methods. According to Michelle’s List, a nationwide database of local digital news outlets, only 3 of more than 300 publications describe themselves as serving immigrant communities. In a similar database compiled by the Columbia Journalism Review from 2010 to 2012, not one of the three-dozen digital outlets out of New York City focused on covering immigrants, who make up nearly 40 percent of the city’s population. (Outlets serving black audiences have similarly been left out of the innovation race, as journalist and publisher Glenn Burkins outlined in the recent Columbia Journalism Review.) With little resources to invest in innovation and training among local ethnic press, the urgent needs for verification of fake news and misinformation have largely gone unmet. Think about that for a moment. One of the country’s largest newsrooms was unable to find an immigrant to talk to for a story about immigrants. Notwithstanding some excellent reporting on immigration by journalists around the country, many local and national newsrooms lack the relationships with immigrant communities that are needed to uncover and investigate urgent and important stories. How can we create a media ecosystem that better serves today’s America — a country where immigrants and their U.S.-born children make up more than one-quarter of the overall population? Researchers and innovators: Study news consumption among immigrant audiences; they may be different from that of white, college-educated, English-speaking news consumers. Foreign-born Latinos, for example, aremore likely than other groups to access the Internet from a smartphone — just one of many factors that may drive a unique distribution strategy to engage immigrants rather than native-born audiences. Editors and reporters: Collaborate with ethnic media to report on issues in immigrant communities. They may be tapped into important stories and sources, and collaboration can strengthen the reporting of both outlets. Daniela Gerson has outlined steps news organizations can take to get started. Funders: Support media innovation serving immigrant communities by inviting ethnic media publishers and innovators to conferences and prioritizing reporting that serves immigrant audiences for innovation grants. Whether the focus is on fake news, community engagement, or business models, it is likely that ethnic media outlets are facing those challenges just as much as mainstream outlets, and may well be addressing them with novel solutions. Finally, understand the difference between covering and serving a community. Newsrooms can invest in an immigration beat, but if the reporting does not address concerns of immigrant communities, is not reported in their languages or distributed via tools and platforms that they use, then the journalism — while by all means important for one audience — may not make a dent in addressing the information gaps facing immigrant communities. As we design ways to reinvest in local reporting, it is important that we consider all of the diverse audiences who can benefit from innovative, in-depth, and engaged local journalism.